Papers describing food drying techniques normally list the obvious contamination risks of drying in the open air as a major disadvantage and and based on this dismiss its application. However, the large volumes of food that are sun dried every year and the savings in energy and capital bely this quickly reached conclusion. Searching the literature and regulations doesn’t give any guidance on the advisability of establishing a new sun drying business. 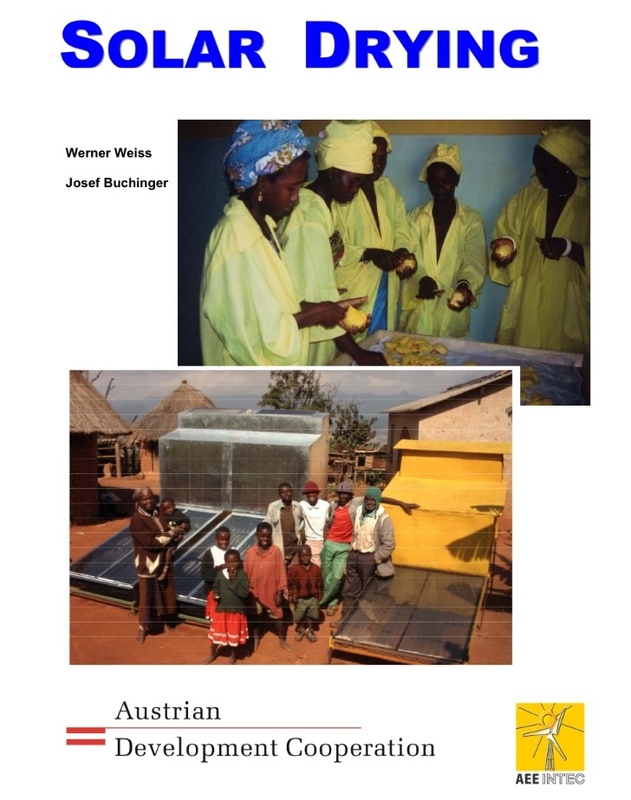 However, the two videos below show the large scale use of sun drying and the associated technologies applied at Cecilia’s Farm, near Prince Alfred in South Africa. It seems that the critical point about the sun dried business they run, is that all fruit is washed before further processing and or packaging. Arguably this makes it comparable to fruit which is often not peeled, packaged salad and leafy vegetables. These are grown in the same environment and simply washed before eating. The massive advantage of sun and to a lesser extent solar drying is that they produce shelf stable foods with minimal environmental impact and low processing and packaging costs. This entry was posted in ..Agribusiness/tech, .Food Processing, Energy, Food Processing, Green / Sustainability, Technology and tagged factory, fruit, products, sun drying on July 18, 2014 by admin. Do Germans Spend 20 Times More Than Chadians on Food? Hungry Planet, a recent book by Peter Menzel and Faith D’Aluisio, presents the food consumption of households around the world. The results are presented in the form of a picture of the family and the food they ate in a week, just like this German family. In each case the total cost of the food is given (in this case $500) as well as demographics of the country and some information on favorite foods. Besides just being interesting and revealing eg this German Family drinks 4 bottles of wine in the week while the French family appears to drink only one, it gives a view of food culture an food processing. Revealing and concerning is the difference between first and third world countries and in particular, Central African countries. 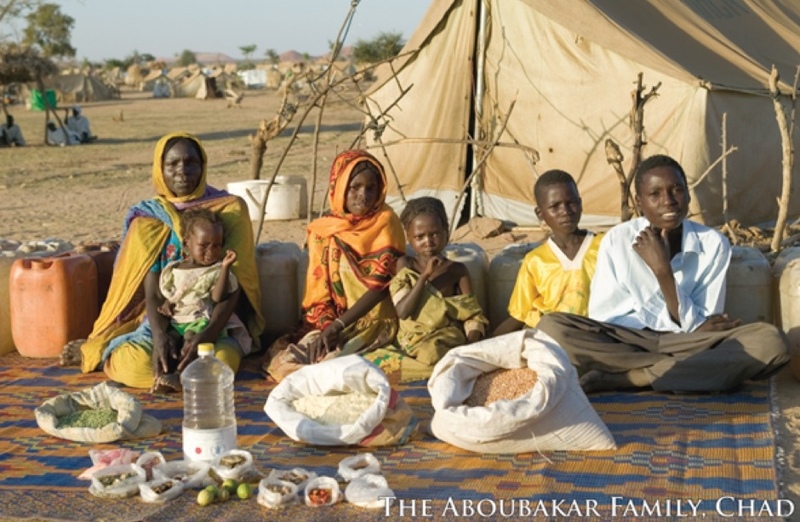 The family from Chad spends only $2,50 on food, just a 20th of the German Family! This is quite startling, although the environmental impact is probably even more interesting given the almost complete lack of processed food, besides post harvest processing, and one way packaging in the food of the Chadian family. 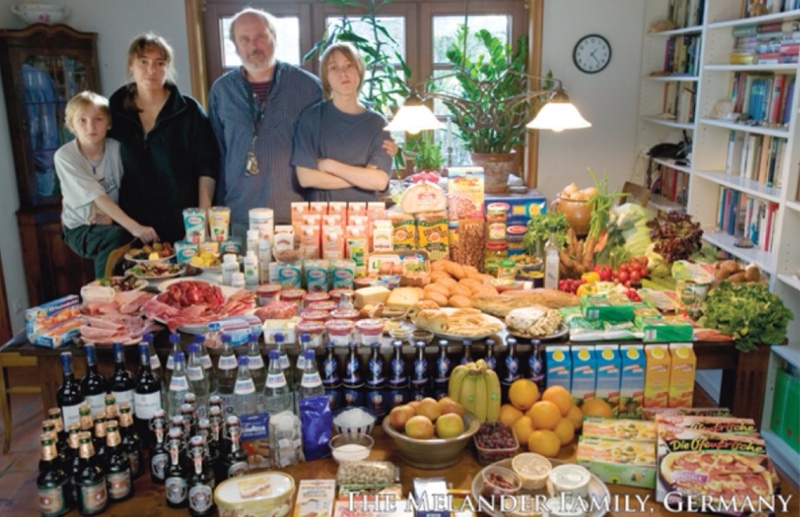 While the German family shows that in a week they used around sixty glass, plastic and board beverage containers. Not much scope for a Food Processor in Chad! The answer to the question in the title is that we can’t tell from these single images. However, we can be sure that the general differences highlighted are an indication of the food culture differences. We also know from the research on waste, that a significant fraction of the food (maybe a quarter) shown in the German home is probably wasted, while very little of that reaching the Chadian household is. This entry was posted in ..Agribusiness/tech, .Interesting....., Development, Food Products, Green / Sustainability, Market /Business and tagged food, household, world on October 3, 2013 by admin. Its true that “One Third of All Food Produced is Lost or Wasted” but it does get a bit boring when we hear it over and over along with a means of reducing it which is simple and obvious. This is made worse by the fact that these means of reducing loss are often very daunting and require actions that you have little effect on. This CTA briefing paper does a good job of summarizing the various places and ways in which these losses can be addressed. It for example shows that consumers in upper income communities need to take care of their actions and reduce losses – something that's hard for the individual to impact on and where no progress is evident. But we should all keep enthusiastic about it and do whatever we can to reduce waste even if our little effort is not going to be significant on its own. This entry was posted in ..Agribusiness/tech, .African Development, .Food Processing, Costs, Energy, Green / Sustainability, Market /Business, Waste and tagged benefits, food waste, reduction on July 5, 2013 by admin. The recovery of food from Food Industry waste will become more and more attractive as food prices increase and per capita availability decreases. In general technology is already available to recover value but the viability limits what is done. This is an interesting approach to improve viability by addressing the logistics of handling waste. Projects like these improve the sustainability of the Food Industry. 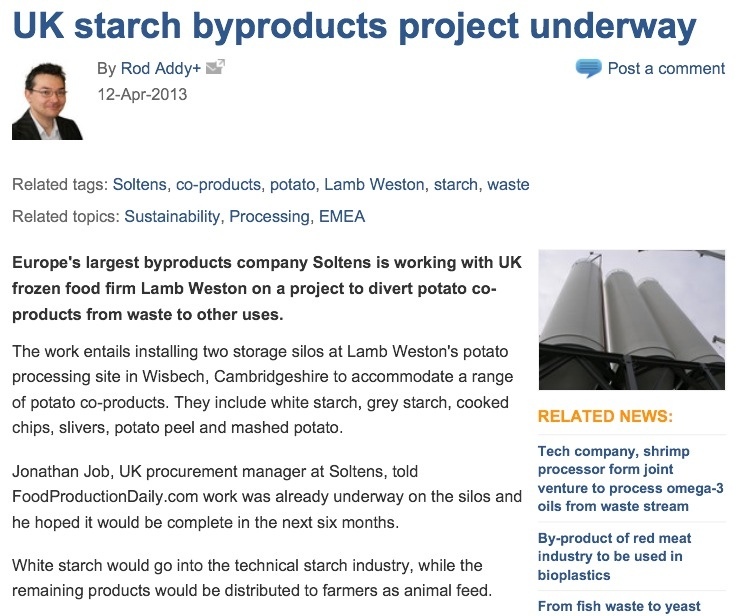 This entry was posted in ..Agribusiness/tech, .Food Processing, Green / Sustainability, Market /Business, Technology, Waste and tagged potato waste, recycle, reuse, sustainability, was, Waste on April 16, 2013 by admin. 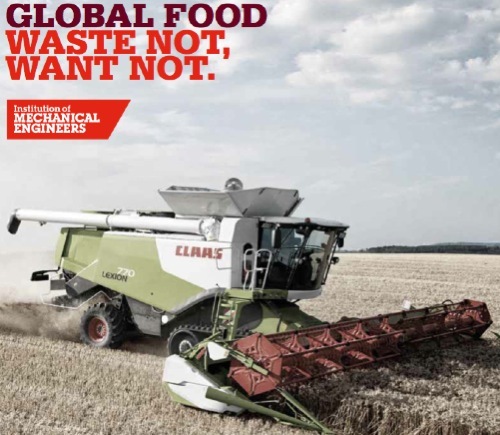 I have written on Food Waste now and then as it's clearly a part of the food supply system where the world can grow food availability using existing technology. 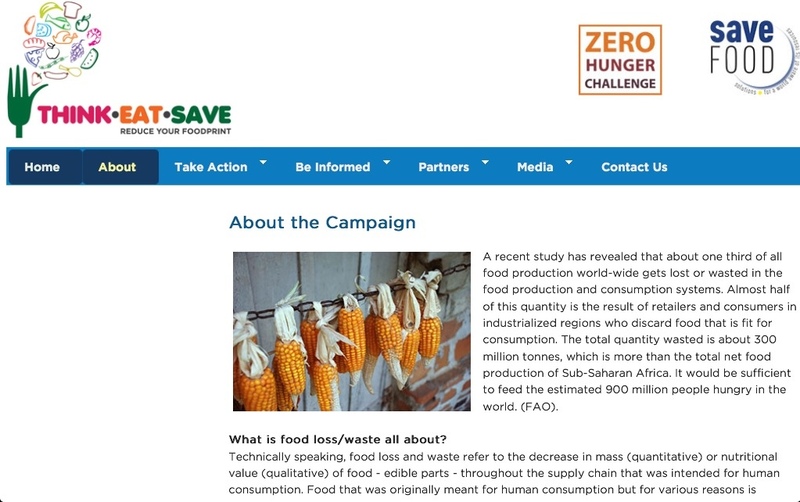 Now a UNEP/FAO lead campaign, supported by initiatives such as WRAP, has been launched. Think-Eat-Save and the slogan “Reduce Your Foodprint” seem to indicate that it is focussed on the consumer, but the information on the site is not limited to the household. The initiative seems to be focussing on the complete food chain. There is already a wealth of information here, presented in a very readable way, and there are indications of actions to promote awareness and action. Awareness raising on the impact of, and solutions for food loss and waste. Collaboration and coordination of world-wide initiatives on food loss and waste reduction. 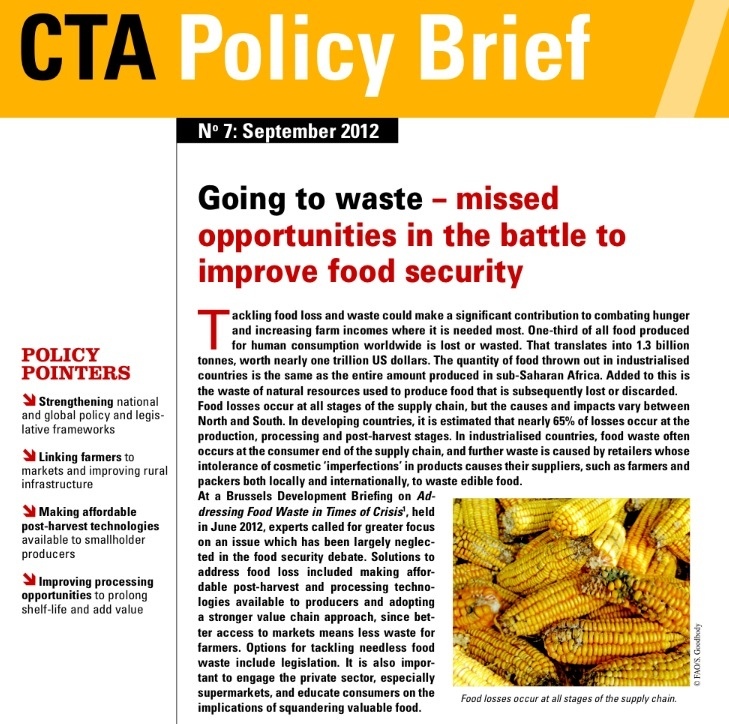 Policy, strategy and programme development for food loss and waste reduction. Support to investment programmes and projects.. This entry was posted in ..Agribusiness/tech, .Consumerism, Green / Sustainability, Waste and tagged fao, foodprint, unep, Waste, waste reduction on February 6, 2013 by admin. When the Institute of Mechanical Engineers publishes a report on solving the expected world food shortage by reducing loss, you begin to realise this is a very widely recognized problem or opportunity. I already published a paper on this titled Waste in the food value chain: Issues and opportunities in sub-Saharan Africa in 2011, which also highlighted the wasted inputs required to produce the wasted food. Most of the solutions are not to do with mechanization, automation or new devices. Cereals lost to poor storage in the third world environment need better management of existing systems and simple waterproofed structures. Losses in the first world retail system are more strongly linked to the need to change consumer behaviour, diet, obesity, visual standards, kitchen control, expiry dates etc than to research new technologies. Some thoughts after reading this: the food we do eat uses twice as much inputs than it would seem, the waste is mainly not on the field where it would could at least compost and fertilize but is increasingly in urban areas where it unnecessarily loads the waste disposal system. This entry was posted in ..Agribusiness/tech, .Agribusiness, Green / Sustainability, Waste and tagged IMechE, Waste, waste reduction on January 24, 2013 by admin.